Boatersland Marine > Deck Hardware > Windshield Parts & Hardware > Taylor Made Windshield Support Bar, 14"
Taylor Made Windshield Support Bar, 14"
Taylor Made Windshield Support Bars are included as original equipment on many boats. Now you can add this windshield accessory to your own vessel with easy-to-install support bars from Boatersland. 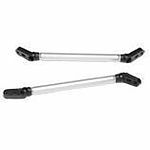 Made from anodized aluminum tubing, these Taylor Made Windshield Support Bars are 14” and sold as individual units.